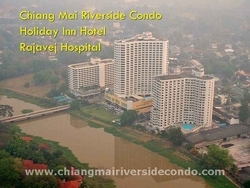 Chiang Mai Riverside Condo-minium is located on prime land in the beautiful city of Chiang Mai, northern Thailand. please click the name-links if you would like to visit their websites. On the banks of the Ping River. Many of the 500 units are facing the stream, the City and the famous Doi Suthep Temple. Nice Swimming Pool, Good Parking, Large Lobby, Laundry Shop. Café - Restaurant, Business center with fax. Free cable tv (30 foreign and thai channels). Free wifi at the lobby, pool and second floor lounge. Gated entrance with 24h security staff. Key-card entrance system at the main entrance door. Lobby area, supervised by security for 24h. CCTV (closed circuit TV) with 10 cameras. Only resident cars allowed at the parking (special stickers) and controlled by the security. Home Where is our Condo? What is a Condo?